Like standard CT, CT fluoroscopy has the advantages of excellent spatial resolution, a wide field of view, optimal imaging of air-filled structures, limited dependence on the operator to obtain images of excellent quality, and the ability to position the biopsy needle in the imaging plane. However, the main limitation of standard CT is the necessity to acquire a series of images after each movement of the biopsy needle, requiring the radiologist to exit the scanning room for each acquisition. Image reconstruction and display take further time. The additional time requirement predisposes to patient movement that may change the needle position in relation to anatomic landmarks. Computed tomographic fluoroscopy obviates leaving the scanning room because images are available in the room and are observed in real time . 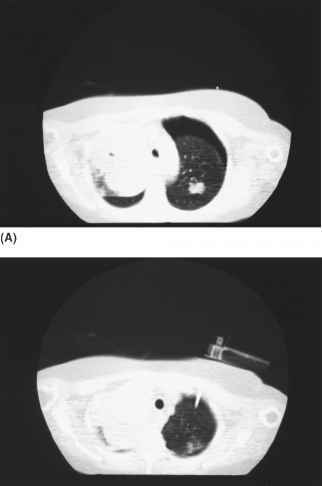 Potential advantages of the real-time capability of CT fluoroscopy include the ability to visually time the biopsy puncture more easily with the phase of respiration and to allow specific placement of the needle at the edge of the lesion, thereby avoiding the necrotic center of a lesion. If the real-time technique is used, the nodule may be seen to be pushed away (balloted) by the needle, allowing a more rapid puncture technique. The real-time imaging of CT fluoroscopy permits rapid diagnosis of complications. Hemorrhage is often recognized around the nodule after biopsy and a needle track is often observed upon withdrawal of the needle. A minority of patients develop frank hemoptysis. 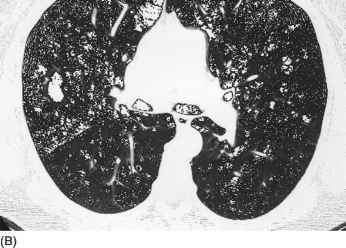 Pneumothoraces are recognized quickly so that appropriate management can be instituted in a timely fashion (Fig. 6). An important subjective advantage of CT fluoroscopy is the increased peace of mind that the rapid image display provides for the radiologist. The short time interval between movement of the needle and knowledge of its location and any complications can substantially decrease operator stress related with the procedure. It is a subjective impression that CT fluoroscopy allows biopsy to be performed more rapidly, particularly for small nodules. However, it is important to recognize that no study has directly compared the duration of procedures done with standard CT and CT fluoroscopy to ascertain if there is a decrease in procedure time with the latter. Likewise, other purported advantages of CT fluoroscopic guidance have not yet been compared directly to those of standard CT.